"Vienna is like a museum” – at least that is the impression many get at first sight when visiting the city. There are still many buildings from the times of monarchy in Austria which can be rented as exclusive venues for gala dinners. The Habsburgs built their summer palace "Schönbrunn Palace" just a few kilometers from Vienna's city center and it is still Austria´s number one sight to visit. However, there are even more summer residences close by, which are always worth a visit. 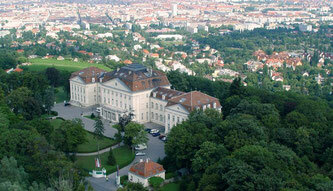 For instance, the city of Baden, which reminds of a noble summer village from former times. All that is still existing for sightseeing experiences, especially with the background that Vienna is the most livable city in the world. The hotel Schloss Wilhelminenberg certainly scores with its impressive location in the midst of forests and vineyards high above the city of Vienna. In the historic setting of a hunting castle, dating back to the 18th century, the hotel offers 87 classical hotel rooms, meeting and event rooms for up to 250 people, as well as an excellent restaurant serving high-class Austrian food. 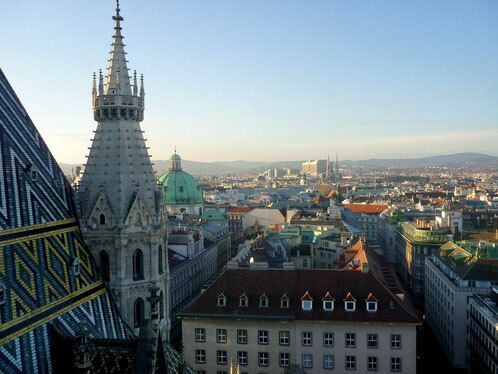 The absolute highlight is the terrace offering a stunning view over Vienna city, which is only 9 kilometers away. The Parkhotel Schönbrunn is located right next to the world-famous Schönbrunn Palace and was once the emperor’s guest house. The imperial ballroom is the heart of the hotel, which offers 70 modern rooms and meeting facilities. 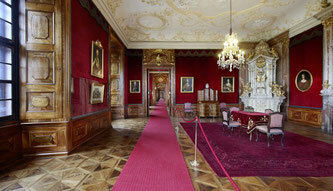 As a highlight, one suite is located directly at Schönbrunn Palace itself. Unique, luxurious and for sure imperial with Vienna's center only 8 kilometers away. This mansion is a part of the beautiful location Lainzer Tiergarten, a place of former hunting grounds in the outskirts of Vienna, 13 km from the city center. Hermes Villa offers wonderful ambience with a high-quality restaurant and of course, traditional Austrian delicacies – some of the ingredients are even directly from the location’s gardens. Their restaurant is ideal for bigger groups up to 150 persons who want an unforgettable experience in a comfortable yet imperial atmosphere. Grafenegg Castle is an imposing building, located close to the Danube valley and vine region “Wachau”, only a 50 minutes’ drive from Vienna. The restaurant offers not just good international cuisine in great ambience, but also a unique view at the impressive castle. Ideal for small to medium groups as the restaurants offers up to 100 seats. Besides the restaurant, the castle also offers extensive meeting rooms and is perfect for an all-in-one meeting day in a very special location! The jewel of Vienna’s Baroque palaces are looking great from the outside but on the inside it is nothing less but jaw-dropping. With its breath-taking stucco elements and gold accents everywhere, the Palais can host up to 180 persons in different rooms. The most spectacular one is the Oval Room, which is ideal for groups from 50 to 80 in banquet style and thus perfect form small to mid-size parties. 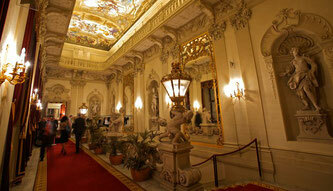 Planning an event right in the heart of Vienna’s Old Town – Palais Ferstel is the perfect location. The historical building, once designed as Viennas stock exchange, is reminiscent of an Italian palazzo. Various rooms from the arcade court are decorated to a large ballroom with beautiful crystal chandeliers, which offer possibilities for great events. 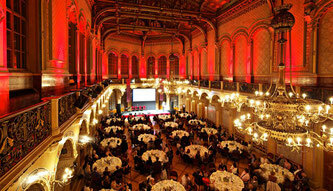 The highlight is the large Ferstelsaal, the right place for meetings or gala dinners from 200 to 350 persons. Our special tip: The famous Café Central is housed in the Palais Ferstel - so what about having a coffee break in a unique atmosphere? The magnificent baroque palace complex, built as Prince Eugene of Savoy’s summer residence, houses the greatest collection of Austrian art dating from the Middle Ages to the present day, including the infamous Gustav Klimt amongst others. As one of the most important art museums in Vienna the Belvedere offers all different kinds of guided art tours for any audience. It is not only worth a visit for the architecture but also to experience the long tradition of Austrian art in all its facets, as well as temporary exhibitions with unique concepts! 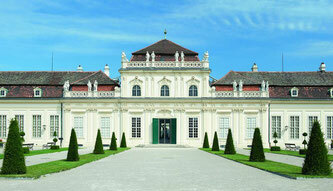 Stift Klosterneuburg is located at the river Danube, approximately 15 km from Vienna. 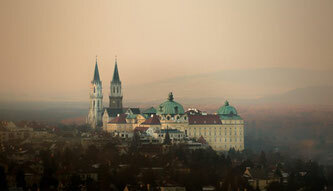 Stift Klosterneuburg was founded in 12th century and used to be both a religious and an imperial residence. The monastry has been producing wine for nearly 900 years. 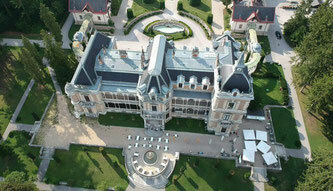 Today it is one of the largest wine producers in Austria, with internationally renowned wines. The monastry offers guided tours through the historical wine cellar. During wine tastings, guests learn about modern winery technology and the history of wine production. Click here for more information of Vienna.